No other continent is as rich as Africa for its variety of music, dance, colours, flora and fauna. Empowering Music, captivating rhythms, the beauty of the costumes and dance movements, the spirit of the jungle and of the desert. 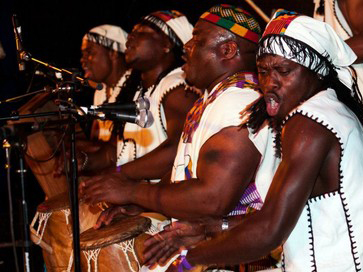 We work with artists covering African music and dance from north to south, and from east to west of the continent. From the Arabic sounds of the Mediterranean sea to the ancient music of South Africa. From the melodic and enchanting sounds of Senegal to the powerful strings of the west African Kora or of the desert blues. Large Drumming ensembles and dance shows to blow your mind, traditional instruments you have never seen, Congolese bands and afrobeat orchestras to shake guests on the dance floor. And then Acrobats, Shaka Zulu dancers, boots dance shows and more. We also offer walkabout Africa themed acts, animal costumes and bespoke productions to bring the spirit of Africa to any event.